The Yoga Trapeze® Door Frame Bar is designed to make it fast and easy to create a solid hanging mount for your Yoga Trapeze®. As an added bonus, it can also be used for chin-ups and pulls-ups. This bar is designed to fit most standard door frames (26-36 inches), and the bar itself can be taken in and out of its mounts between uses for your convenience. 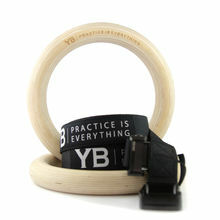 Yoga Trapeze® Door Mount Bar has been added successfully to your wishlist. There are many ways to install your Yoga Trapeze®, but many of our students love the door-mount bar because it's fast and easy to use! Works just as expected in my doorway. I purchased this to use as a cheaper alternative to the doorway bars marketed for kids indoor swings and it has worked out great! Not only can my 40 lb 3 year old swing and spin in his hammock hanging from this but I can cuddle with my boy while we watch a movie and I'm sporting 215 lbs myself. So this will have no issue supporting 255 lbs of gentle use or 40 lbs of a bit more vigorous use. This bar also features a nifty locking mechanism. By insuring two lil metal pieces are in place on both of the anchors the bar can not be lifted out of them. So no accidental mishaps. Appreciate that I can unlock & remove the bar if I don't want it up continuously, though I do leave it up as it doesn't at all impede with usage of the door. Yoga trapeze with door mount allows me to do needed stretching and strength in a place with limited space. The ball is the perfect tool for trigger point work and massage. I have the ceiling mount for the trapeze but have not yet been able to set that up, once done that will expand what I can do with the trapeze. I appreciate the quality of products I have. 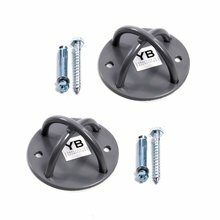 I purchased the door frame yoga bar for [Trapeze] yoga inside your home. I am grateful I made this purchase because now I can practice anytime I want! I was originally working out with just the rings on the swingset in the back yard. I then added a pull up bar for inversion and more indoor workout to my routine. I'm just getting acclimated to the yoga trapeze. I love it and I think it's going to really enhance my workout. Thank you!